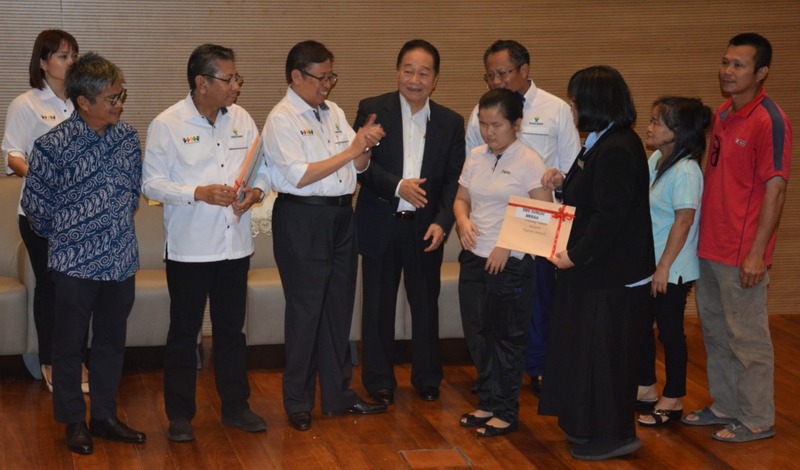 Abang Johari (fourth left) congratulates Yak Fang Ling (SMK Sungai Merah) – born with vision impairment, of award recipients for excellent result in SPM, while (from second left) Dr Annuar, Azmi, Wong and others look on. SIBU: Sarawak invests in a global education system to produce quality graduates capable of competing globally, said Chief Minister Datuk Patinggi Abang Johari Tun Openg. For that reason, the state government has set up University College of Technology Sarawak (UCTS) here through Yayasan Sarawak’s investment, besides investing in Curtin University and Swinburne University of Technology in Sarawak. “If we don’t have a global education system, we fear that when we (our students) graduate later, we are ‘champion kampung’ even though the learning and (academic) results are good but only within our own standard. “But if we cooperate with international universities, which already have high quality – that becomes our benchmark. We can produce quality graduates and they can continue their studies to postgraduate and all the way to doctorate level. “This will generate a research culture in education in our efforts to add value to our resources in the state,” he said when gracing Yayasan Sarawak Excellent Students Prize Handing Ceremony 2018 for Sibu Division today. Abang Johari further stressed that for any country that want to develop – talent and skills are very important, which can only be acquired through a system of education that will give them a certain trend and direction to achieve. “What we call the transformation of global economy and we have to adjust ourselves to the needs of this transformation programme. “That is why we in Sarawak invest through an education system that is different from other states because we have Yayasan Sarawak. Through Yayasan Sarawak’s investment to set up universities and provide scholarships and loans, which is a big investment,” he added. He pointed out that although education is under the jurisdiction of the federal government, in tertiary education – the state has a say. Abang Johari also dwelled on new discipline offered in universities related to new technology in line with Industrial Revolution 4.0. Meanwhile, Yayasan Sarawak director Azmi Bujang said 20 schools in Sibu division received Yayasan Sarawak Excellent Student Award which came with a Bank Simpanan Nasional (BSN) premium savings certificate. He said each student received RM500 for SPM while RM700 for STPM. “Sibu district has 206 recipients for SPM while eight from Kanowit. As for STPM, Sibu district has 21 recipients while Kanowit has five,” Azmi said in his speech. He disclosed that there were 1,432 recipients across Sarawak last year. At the same function, parent-teacher-association (PTA) grant was also given to four schools namely, SK Rantau Panjang (Sibu), SK Tanjung Penasu (Sibu), SK Ulu Majau (Kanowit) and SK St Mark (Selangau) – each getting RM10,000. Also present at the function were Minister of International Trade and E-Commerce Dato Sri Wong Soon Koh, Assistant Minister of Education and Technological Research Dr Annuar Rapaee, Deputy State Secretary (Socio-Economic Transformation) Datu Mohamad Abu Bakar Marzuki and UCTS vice chancellor Prof Datuk Dr Khairuddin Abdul Hamid.